I bought a computer motherboard and it’s been crashing. I’m trying to figure out what’s wrong, by recording how long the computer is up before it crashes. The sampling has been completed, and it’s pretty obvious that one of the RAM sticks is not working with this motherboard. Crashing Computer, Troubleshooting RAM: Partial Samples from the Tests. 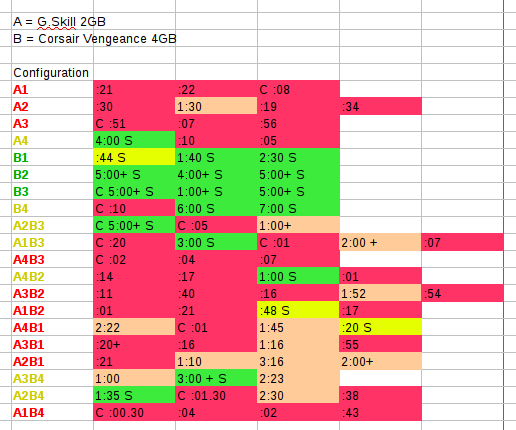 I found the problem pretty early on, but decided to go forward with collecting data for all the configurations. Here are the results. Collecting crash info for different RAM configurations. I altered the coloring a little bit. Green means the computer didn’t crash for more than one hour. Yellow means the computer didn’t crash, but the session was short, so, it’s not really a good sample. Red means it crashed before one hour. Light orange (peach) means it crashed, but ran at least an hour. Obviously, the A stick is not compatible with this motherboard. I hesitate to say “bad” because it was working fine in the old motherboard. The B stick seems to work fine, save one crash in slot 4. When both sticks are installed, the crashes dominate, but there are also these orange blocks, indicating long runs before crashing. There are some deceptively long sessions in there, like the first session with A2B3, and A2B4. If you’re not recording the crashes carefully, you could find yourself pretty confused. This implies something: if you’re testing RAM, test each stick independently. Install each stick in each slot, and boot to test. It’s OK to go to virtual memory, too. It means you’re use each byte of memory (or almost). When both sticks were installed, stability improved: maybe the computer didn’t use the problematic parts of the memory chips for a long time. 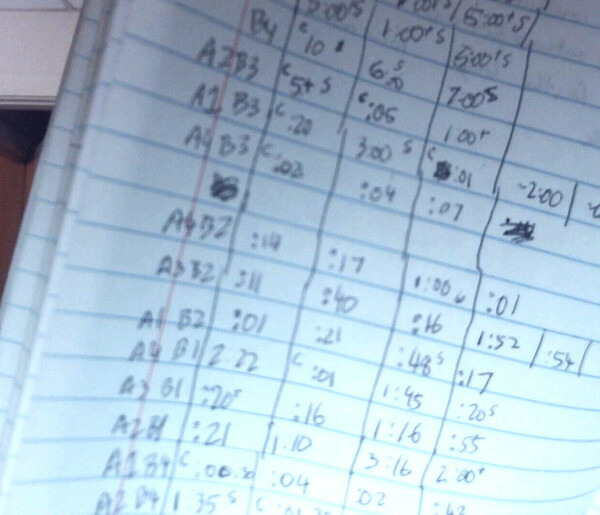 It’s also important to record the data on paper. Don’t use the computer, unless you have software that records the crashes for you. I added colors to the combinations, in the left column. I didn’t really do this right, but basically, if the row was red, it was colored red. Same for green. Rows with a mix of colors got dark yellow, which I called “olive”. To get more info, I should probably write software to track the crashes, and also break out the meta-information about cold starts and shutdowns into their own fields. I would do a little more work on this, but I’m tired, and I just reconfigured the computer to use the B memory stick in slot 3, so I am no longer crashing. That was the goal, and writing this blog post was the goal. So, “the end” with this post. TL;DR: test your RAM one stick at a time. If anyone asks why, show them this article.